There are many different methods of resistance training. One form of resistance exercise that has drawn attention is superslow resistance training. Evidence of increasing interest is becoming more apparent with the rise of internet references and the availability of superslow certifications. This form of training has been presented as a safe and effective means of building strength in both beginning and advanced weight training (Westcott, 1999). Superslow training, originated in 1982 by Ken Hutchins, was developed in an osteoporosis study with older women because of the need to utilize a safer speed for subjects to perform the resistance exercises. The result was the beginning of a new resistance training technique, which became known as superslow strength training. In a standard Nautilus training protocol, 8-12 repetitions are performed (Westcott, 1999). Each repetition represents a two-second concentric action, a one-second pause, followed by a four-second eccentric action. The total time for the set requires approximately 55-85 seconds for completion. The superslow protocol represents 4-6 repetitions consisting of a 10-second concentric phase followed by a four-second eccentric phase. This protocol also requires about 55-85 seconds for completion. One possible advantage of superslow training is that it involves less momentum, resulting in a more evenly applied muscle force throughout the range of motion. A potential disadvantage of this training is that it is characterized as tedious and tough. The other recent peer-reviewed manuscript describes a study by Keeler et al. (2001). This study consisted of 14 sedentary women with an average age of 32.8 ± 8.9 years. The subjects were randomly assigned to either a superslow group (6 subjects) or a traditional training group (8 subjects). Strength was assessed for both pre- and post-test using a 1-RM on 8 strength exercises: leg extension, leg curl, leg press, bench press, compound row, biceps curl, triceps extension, and torso arm (anterior lateral pull-down). The subjects trained three times per week for 10 weeks. For this study, the superslow protocol was defined as a 10-second concentric muscle action, followed by a 5-second eccentric muscle action. The traditional protocol consisted of a 2-second concentric phase, followed by a 4-second eccentric phase. Both groups performed one set of each of the eight exercises reaching momentary muscular fatigue between 8-12 repetitions. The traditional and the superslow groups began the exercises using 80% and 50% of the 1RM, respectively, until muscular fatigue was reached. The weight was then increased in increments of 5% when the maximum repetitions could be completed in good form. Increments of 2.5% were used for the leg press exercise only. The results indicated that both groups had a significant training effect for the 8 exercises. Further, the traditional group improved significantly more than the superslow group in total weight lifted for the leg press, leg curl, leg extension, torso arm, and the chest press. The results for the chest press indicated that the traditional group improved by an average of 26 lbs compared to the superslow group improving by an average of 9 lbs. It was concluded that traditional training is superior to that of superslow strength training for improving strength as assessed with the 1-RM for the initial phase of strength training in sedentary women. The Westcott et al. (2001) manuscript describes two studies (1993 and 1999 studies) that report the superslow resistance training resulting in superior strength gains than a traditional strength training method. In contrast, the Keeler et al. 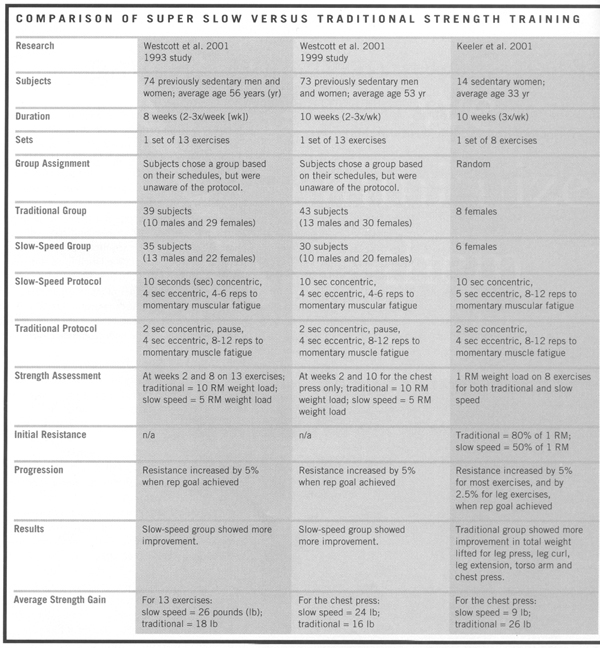 (2001) study indicates that the traditional strength training group improved better than the superslow group for 5 of the 8 exercises. The different outcomes between studies may be due to different subject populations, training methodologies, and testing procedures. Westcott et al. recruited sedentary men and women with an average age in both studies of 54.5 yrs., where as the Keeler et al. study had sedentary women whose average age was 32.8 yrs. Very little is documented how various age populations may be differentially affected by the training regimen (superslow versus traditional speed), although this factor certainly needs further elucidation. Enoka, R. M. (1988). Muscle strength and its development  New perspectives. Sports Medicine, 6, 146-168. Smith, L. K., Weiss, E. L., & Lehmkuhl, L. D. (1996). Brunnstroms Clinical Kinesiology (5th ed.). Philadelphia, Pennsylvania: F. A. Davis Company.